Gov. Andrew Cuomo assesses the L train tunnel during a December tour. There are always unintended consequences to governing carelessly by unexpected press conference and off-the-cuff commentary, and as Gov. 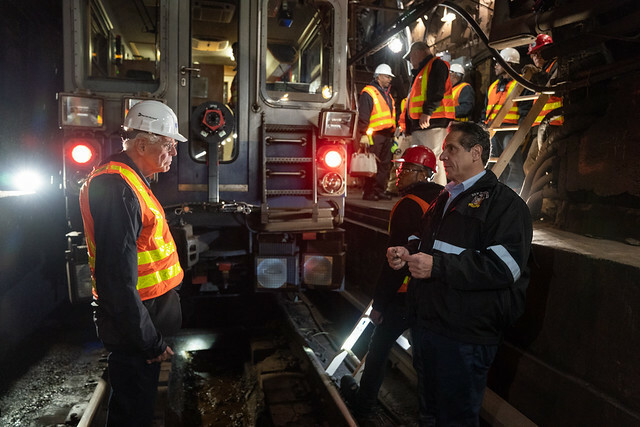 Andrew Cuomo and his team embarked on a tour to salvage whatever credibility they have left, it’s becoming clear that the crisis precipitated by Cuomo may open the door to MTA reform. Now, it’s a matter of who will take the reins and how. Movement on MTA reform has been very slowly gaining speed over the past few months as more people have been paying attention to the way the MTA Board operations (or doesn’t) and the inherent contradictions in the current board structure. I’d urge to read Aaron Gordon’s November Signal Problems dispatch for more on that topic. Cuomo starts out strong, but his comments fizzle toward the end. He engaged in another diatribe on whether or not he controls the MTA (he does), and The News gave him more cover for this argument than I would have, allowing Cuomo to compare the MTA (which he controls) to the Port Authority (which no one controls). It’s not an apt comparison, and it reminds me of the problems with trusting Cuomo with MTA reform. Cuomo doesn’t listen to experts; rather, he thinks he is the expert. So if he has a vision for MTA reform (just like he has a vision for the L train work and a vision a backwards AirTrain), his vision will become reality whether it’s an improvement or not. But in his opening remarks at least, he hit upon a key problem with the New York City transportation ecosystem: It is very much a transportation industrial complex with a very active revolving door shuttling the same people between the public and private sectors. This essentially eliminates any incentives for internal-driven MTA reform as the same people who sign off on contracts end up being the same people who benefit from runaway costs and project timelines in years rather than months and decades rather than years. The “difficulty” in dealing with agency bureaucrats is a feature, not a bug. Cuomo, who spoke about MTA reform in the lead-up to his reelection last year, hasn’t given any indication that he has a vision beyond adding more seats under his control to the Board. I’m not quite sure where that gets him considering the MTA Board has never rejected a Cuomo initiative and he already has legal control over the agency. The reform must be structural and not cosmetic, and the L train mess, which has led everyone to rightly question the competency of the MTA, is an opportunity to push for major reforms. The problem, of course, is that the L train mess has also led everyone to question Cuomo’s competency here, and as I keep saying, no one currently involved has any credibility on the topic. Thus, the person spearheading reform shouldn’t be the person few trust. Analyzing the ins and outs of city control is both well outside the purview of this post and premature without a proposal in hand, but it’s clear that something’s a-brewin’ in New York over MTA governance and MTA control. If anything comes out of this crisis of confidence Andrew Cuomo created last week, a true push for MTA reform would be a welcome one, and the shape and a full public debate on structure of transit governance in New York City is one that is long overdue. The city and state have spent months sparring over the subway action plan. With the money in place, can the MTA deliver? I haven’t burned too many pixels writing about the politics behind the funding for the subway action plan because it is frankly an embarrassing distraction from the real issues at hand. The $1 billion will not, as Aaron Gordon recently wrote for The Village Voice, actually fix the subway problems, and the Mayor and Governor have both come across as childish and petty leaders who can’t set aside superficial differences to attack a problem affecting both of their constituencies. The MTA needs real reform and leadership, not money for arrows that urge people to move into the middle of a subway car. Ultimately, the MTA is Gov. Andrew Cuomo’s responsibility. The state controls MTA appointees and the makeup of the MTA Board, and that message has started to sink in more and more these days. Still, after months of politicking and disputes over dollars that stretched back to last summer, Bill de Blasio agreed to add nearly half a billion dollars to the subway action plan. With a new City Council more sympathetic to Cuomo and keen to move beyond this debate, the mayor granted Cuomo his wish, and the full plan will be funded. We’ll see how quickly this improves commutes; so far, the subway action plan hasn’t resulted in any noticeable improvements in subway reliability. As elected leaders of the City of New York who are responsible for its fiscal health, we must ensure that precious taxpayer dollars are not diverted away from the subway crisis to other MTA priorities. The City pressed aggressively for a “Lock Box” as a condition of providing $418 million towards the SAP. Now that the Lock Box has been made explicit in State law, it must be put into practice by the MTA. It is important that the MTA provide detailed information about each of the plan elements, including the scope of work being performed, how success is defined, and how progress is measured. Unfortunately, although the MTA began implementing the SAP last July, it has provided scant details to the public on its progress and the MTA’s own “major incidents” metric shows little improvement in service. City taxpayers deserve to know that they are getting a good return on their investment. The public is skeptical when it comes to work performed by the MTA, especially given recent public reports about prolonged delays and billions of dollars in cost overruns on MTA projects. For example, the East Side Access Project, which started with a budget of $4.3 billion and a completion date in 2009, will now require an additional billion dollars with a completion date in 2022 and an estimated price tag of $11 billion. The Enhanced Station Initiative, which started with a budget of $936 million to renovate 33 subway stations, will now require $846 million to renovate only 20 stations. It is incumbent upon the MTA to prove that it can be an effective steward of this short-term emergency plan and that the revenues with which it has been entrusted are prudently invested to deliver results. To that end, we must have certainty that the Lock Box will be implemented and that the City’s contribution will actually be spent on projects that will improve subway service. I’m somewhat skeptical this letter will do much to move the needle. After all, the city has already ponied up the money, and the letter doesn’t attach actionable conditions to the dollars. The city similarly dropped the ball a few years when the mayor walked into Cuomo’s trap on capital plan funding and failed to ensure its contributions would go toward identifiable city improvements. But the MTA has expressed a willingness to adhere to the city’s requests. Joe Lhota, last week, in fact said the MTA embraced the call for transparency but didn’t respond to each of de Blasio and Johnson’s requests.